Dressing up for Halloween can be so much fun! While the actual night is a blast, even the “deciding what to be for Halloween this year” is often a really enjoyable time for kids. What does the boy in YOUR life want to be this year? Or are you here looking for ideas? 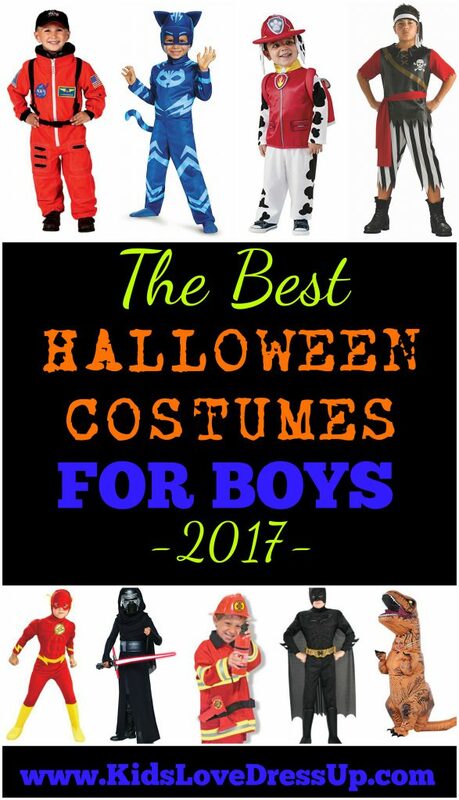 If so, we can totally help you out with our compilation of the best Halloween costumes for boys for 2017! We’ve collected 12 awesome ideas for your little man that will be exciting, fun, popular, highly reviewed, and fantastic options! He’ll be proudly parading down the street in any of these great get-ups! 12 of the Best Halloween Costumes For Boys for 2017! There’s something very cool about space travel, astronauts, rockets, and moon-walking – something that simply fascinates kids (of all ages). 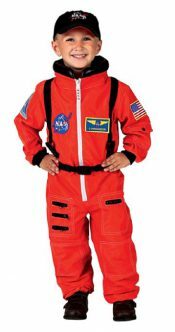 This super realistic looking Astronaut costume by Aeromax will help them feel like they are ready to take off into the unknown! It’s available in orange or white, and comes with the jumpsuit, embroidered cap, and NASA patches. Rated 4.8 / 5 stars by over 1,350 reviewers! 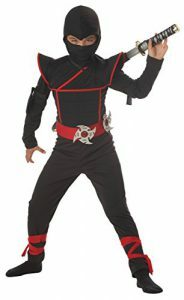 It comes with the black warrior jumpsuit (attached hood and ties), belt with foam stars, and face mask. Weapons are not included. This is one of the best costume sets we’ve ever had at our house. It gets played with ALL the time, and will be my son’s obvious choice for Halloween this year. The quality of the Melissa and Doug costumes is incredible! And the included accessories are superb! 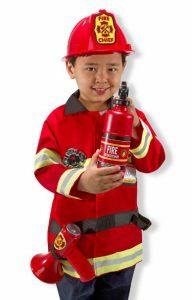 Your little guy will be “all fired up” about this Marshall PAW Patrol Costume for Halloween this year! PAW Patrol remains up on top for popular costume choices for both girls and boys this year. Definitely worthy of being on our list of “The Best Halloween Costumes for Boys”. 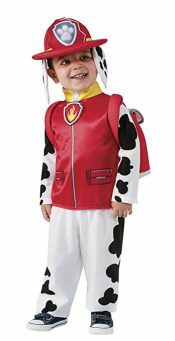 Although this particular one is the “Amazon’s Choice” for Marshall costumes, to see other options we’ve uncovered, check out: Marshall PAW Patrol Costume Options: Which Is YOUR Child’s Favorite? Is there a Harry Potter fan in your house? For kids who are a bit older than the PAW Patrol set, Harry Potter would be a fun costume for Halloween this year (it has been very popular for many, many years now)! This ankle length fleece robe (black with burgundy accents) is complete with the Gryffindor house emblem. Add a pair of round frame glasses, draw on a lightning bolt scar, and you’re good to go! Tip: Your child can get double usage out of this one for World Book Day or Book Week dress up days! Rated 4.2 / 5 stars by over 820 reviewers! Kids love dressing up as and playing cops! Plus, it’s an admirable thing to teach your child to respect the law and want to be a positive force in the world around us! 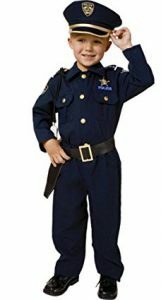 This navy costume set is one of the most popular police costume sets for kids. It comes with Shirt, Pants, Hat, Belt, Whistle, and Gun Holster. It’s machine washable (yay!) and very realistic looking, with embroidered patches, real buttons, and real pockets. He’ll love it! Rated 4.6 / 5 stars by over 1,565 reviewers! Ok, how fun is this inflatable costume? If your boy loves Jurassic World with all of its scary dinosaurs, and if he’s looking for something UNIQUE for Halloween this year that is absolutely amazing and will get him lots of oohs and ahh’s, this is a great costume option! It fits kids up to approx. 54″ in height, and has an included fan that runs on batteries (not included) so that he won’t get overheated. Rated 3.7 / 5 stars by over 315 reviewers! This is a fantastic costume for any Dark Knight Batman fan! It comes with the muscle chest jumpsuit and mask, cape, attached boot-tops, belt, and jumpsuit. He’ll feel like a real hero in this superhero costume, ready to save Gotham city (and your own neighbourhood) from all of the bad guys he can find! Rated 4.2 / 5 stars by over 680 reviewers! Kylo Ren, the Star Wars: The Force Awakens character this year for Halloween. 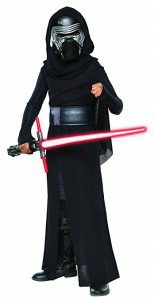 This particular costume comes with the robe, hooded cape, belt, and mask (the mask has some faux battle damage to make it realistic to the movie scene). Accessories are sold separately. Rated 4.7 / 5 stars by over 350 reviewers! Pirates remain a top choice for boys Halloween costumes this year! Wild and adventurous, your boy will love dressing up as a fearsome pirate! He’ll love this particular costume by Halloween Concepts too – it’s comfortable, wild-looking with the jagged edges and belt, has bold colors and print, and has a fun head tie! YOU will love the price. Rated 4.5 / 5 stars by over 200 reviewers! An officially licensed, adorable costume for your little guy! 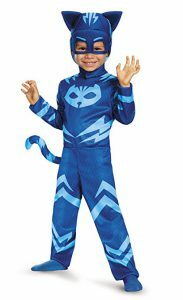 He’ll be able to join in on thrilling night time adventures dressed up as his favorite super hero, Catboy! Rated 4.4 / 5 stars by over 175 reviewers! 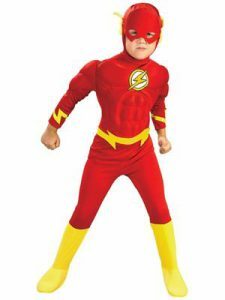 If your little guy loves speed and loves superheroes, you may have to introduce him to “The Flash”, the superhero who is as quick as a bolt of lightning… if he hasn’t met him already. And then, you may have to get this “The Flash” Deluxe Muscle Chest costume for him! It’s awesome! Rated 3.8 / 5 stars by over 465 reviewers! And there you have it! 12 of the Best Halloween Costumes for Boys for 2017! Any of these will be a fantastic choice for your young man! Which one will YOURS pick… any of these? Let me know in the comments below! I’d love to hear from you! 12 Awesome Costumes For Boys Who Love Adventures! Great review on boys 2017 Halloween costumes. You’re right…kids do like to dress up. We’ve always had a cedar chest full of dress up clothes and kids don’t like to wait for Halloween to dress up either. In fact, our neighbor’s son wore his spider man suit every day for a month. Haha… that’s so fun! I can just imagine all of the neighbourhood having a good chuckle at glimpsing Spider-Man playing on his bike or the swings! We love playing dress up here too! My daughter is huge into her fancy new Queen Elsa dress that she earned for doing her chores cheerfully and quickly… (AWESOME motivator haha). She would wear it EVERYWHERE if I let her! (I have a hilarious picture of her wearing it shucking corn for dinner LOL). I remember as a very young boy how much I looked forward to Halloween. Like you’ve mentioned choosing the costume is just as fun as actually wearing it on the big day. I remember all of friends bragging to each other about what we were going to be. These were some of the best memories of my childhood. I think you’ve done an amazing job at providing some really cool costumes for this crowd. Things don’t need to be gore related to be awesome. For starters the Harry Potter costume is by far the coolest one on this list. Too, bad he wasn’t around when I was young because I would have been him every single year. I remember being a ninja my on multiple Halloweens. This was about the time that Power Rangers were actually cool and not what they are now LOL. Thanks for putting this awesome article together. You’ve made my life quite a bit easier. My nephews are quite crazy about a few of these characters already. First off, thanks so much for taking the time to comment! I’m so happy that you enjoyed reading this post – and that it brought back so many great memories for you! I loved Halloween as a child. My mom did a fantastic job helping us make great costumes every year – and now that I have my own kids, I’m right back into the fun again! Even writing this post I got a whole bunch of ideas for my own kids – and myself! Maybe I’ll have to get myself one of these costumes and dress up to take them Trick or Treating! That’d be a riot! I’m guessing we’re close to the same age as I know exactly what you mean about “when Power Rangers were actually cool”… and being ninjas… my brothers were ALL OVER that too! Cheers! And hope you have fun with your nephews this Halloween! I also notice that there are two firefighter costumes here. Why is that? And I didn’t know that Melissa and Doug sold costumes. My wife and I are big fans for their toys. Oh! I just thought of an idea with the Harry Potter costume. Since my daughter’s name is Hermione, it might be the perfect idea to get her to dress up as Hermione and my son as Harry or Ron. But then, my daughter does not know who Harry Potter is. What do you think? Thanks for writing in! The 2 firefighter costumes are actually different… the one is a genuine “Firefighter” (Melissa and Doug one), and the other is a costume of Marshall, the Fire Rescue Pup from PAW Patrol (the kids tv show). Both would be huge hits I think! I think the matching dinosaurs idea is HILARIOUS. 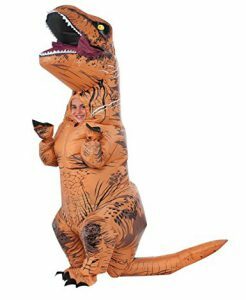 I’d be tempted to “reward” any kid who came dressed up as a dinosaur like this one double candy! I think it’s a 3.7/5 stars because it’s not the easiest costume to get around in for some kids. Some kids also don’t like having something around their faces – meaning lower “marks”. As for your question about Hermione, I saw a fabulous pic of a family costume where the Dad dressed up as Hagrid, and his 3 small children were Harry, Ron, and Hermione. It was AWESOME! To me, Halloween is for the kids though – would your daughter LIKE the costume? Or would her little heart be broken that she can’t go as a Princess (or firefighter… last year my daughter had her heart set on being just that). Cheers! Have a great day!